Our largest NEW product has more headroom & ideal for a large office customization. 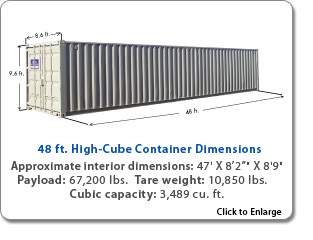 Get headroom and higher cubic volume with our 48-foot high-cube unit. If you want to customize our base unit for office space, the higher headroom feature makes the 48-foot high-cube unit ideal for you. Custom features We can modify sales units to customer specifications. Generally we?ll custom-build any size container. Modifications include but are not limited to doors, windows with security bars, additional lock boxes, skylights, turbine vents, custom HVAC units, sliding doors, rollup doors, window awnings, custom paint colors, and custom vinyl flooring.